In boxing, a big, lucrative matchup is typically followed up by a bigger, even more lucrative rematch. 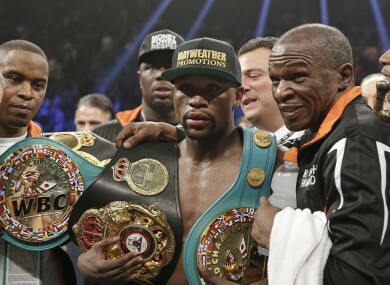 Floyd Mayweather Jr, left, poses with his champion's belt at the weekend. THE LATEST FIGHT of the Century came and went on Saturday night with Floyd Mayweather Jr beating Manny Pacquiao in a unanimous decision. In boxing, a big, lucrative matchup is typically followed up by a bigger, even more lucrative rematch. If the fighters split the first two fights, all the better, because that means a third fight and more millions for the fighters and everybody involved. But Mayweather-Pacquiao I was not your standard fight and there are several reasons there will never be a Mayweather-Pacquiao II. The fighters waited too long. Mayweather is 38. Pacquiao is 36. If this fight had taken place five years ago or even three years ago, there would have been time to fit in a rematch. However, Mayweather has just one fight left on his contract with Showtime and Pacquiao’s deal with Top Rank promotions and HBO expires at the end of 2016, which means he probably has just three fights left before he turns his attention to his many other interests. Mayweather has made it clear that he his next fight will be his last and that he will soon relinquish his title belts. A rematch would be far too complex. Nothing is ever easy in boxing where so many different sides must come together to stage a fight. The Mayweather-Pacquiao fight took those complexities to a new level and if not for the sheer anticipation of the fight and the money involved, it probably would have never happened. While there was an agreement in place between the fighters months ago, the promoters did not reach an agreement with the MGM Grand casino until ten days before the fight, delaying the distribution of tickets and leading some to wonder if the fight would even take place. On top of that, there was the unique situation where Mayweather (Showtime) and Pacquiao (HBO) were contracted to different pay-per-view providers, meaning the two rival networks had to work together and assume co-broadcasting roles. This fight wasn’t Marvin Hagler vs. Tommy Hearns where both fighters came straight out from the opening bell and tried to knock the other’s head off. With Mayweather’s defensive genius, this fight was more of a chess match than many casual sports fans were ready for. The aesthetics of the match were further hampered by an unreported shoulder injury suffered by Pacquiao prior to the fight. Many fans were left wondering why they had spent $100 for a fight with so little obvious action. Even those close to the sport acknowledged that it wasn’t an exciting fight. To make matters worse, Mayweather won the fight comfortably and there is little reason to believe Pacquiao would fare much better in a rematch, a rematch that would not draw nearly as many pay-per-view buys. Floyd Mayweather says he made an extra $150 million by waiting five years for this fight. Pacquiao also more than doubled his take by turning down Mayweather’s $40 million offer to fight in 2012. It’s a good thing they were able to maximise their earnings, because there won’t be a chance to make even more on a rematch. Email “Here's why there won't be a Mayweather-Pacquiao rematch”. Feedback on “Here's why there won't be a Mayweather-Pacquiao rematch”.